With its marble looks and granite toughness, sometimes quartzite does seem too good to be true. And because of widespread mislabeling, sometimes it really isn’t true. One of the downsides of quartzite’s popularity is a tendency for a quartzite label to be put on stones that aren’t actually quartzite. 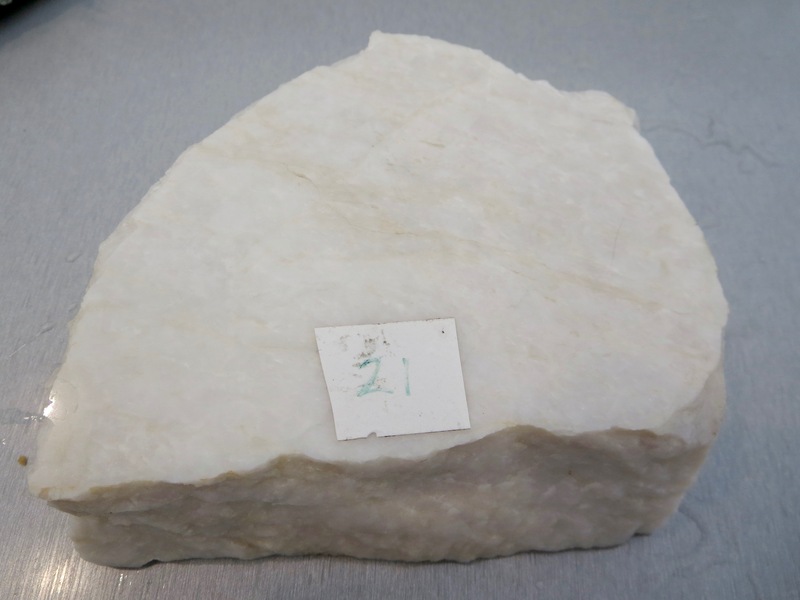 Thus, the burden falls on local dealers, fabricators, and consumers to try to figure out if a given quartzite is the real deal or if it’s one of many imposters. Overall, this isn’t a terrible thing. 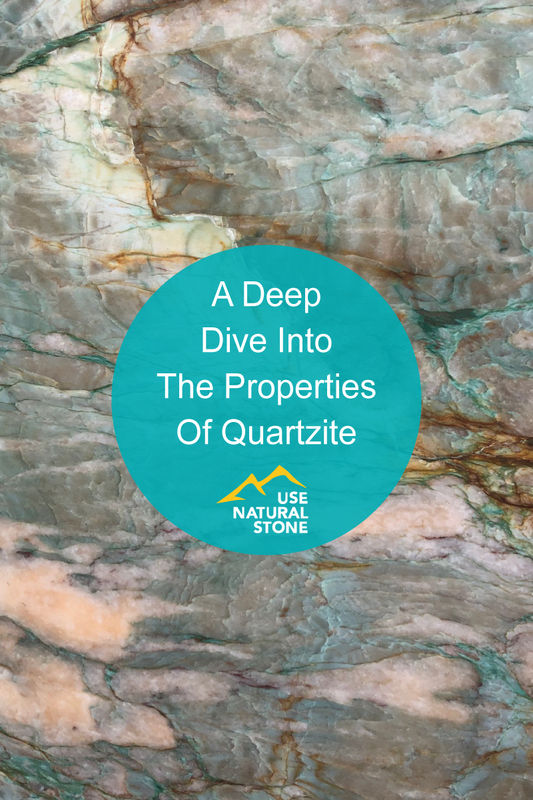 Quartzite is pushing people to look beyond aesthetics and use the properties of a stone to determine what it is and how we should use it. Looks can be deceiving (and alluring!) but a stone’s inherent traits are something we can rely on, every time. 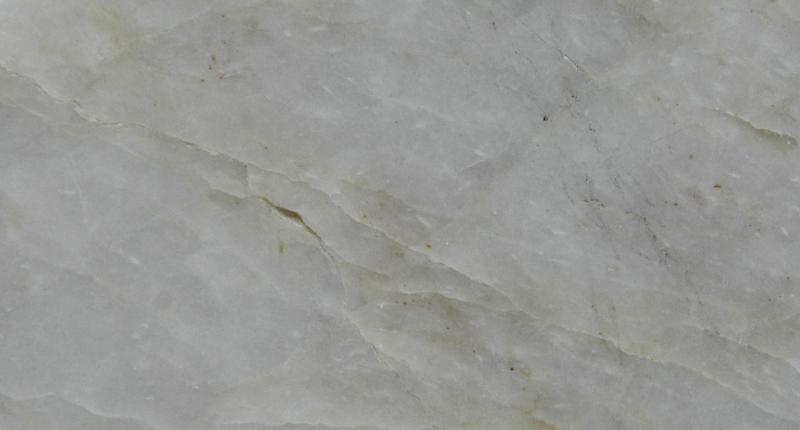 Case in point, the most common mixup around quartzite is that marble is sometimes incorrectly called quartzite. Thankfully, this question is easily resolved with hardness and etching tests. Quartzite is hard; marble is soft. Anyone with a glass tile can easily tell the difference. 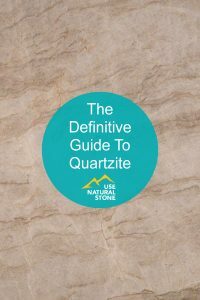 The details are spelled out in The Definitive Guide to Quartzite. Lately I’ve been seeing a new wrinkle: sandstone being labeled as quartzite. This one is trickier to resolve, because sandstone and quartzite are made of the same mineral – quartz – and they have similar properties. Both sandstone and quartz have a hardness of 7 and will easily scratch glass. Neither will be etched by common acids. So how do you tell sandstone and quartzite apart? And does it even matter? The bottom line is, yes, you can tell quartzite and sandstone apart by examining their textures. And, yes, it does matter in terms of porosity. Moderately porous stones are perfectly usable, but should be sealed in certain applications (such as countertops or flooring) and may be more prone to staining. Given the choice between an accurate name or a generalized, semi-true label, we should always go with the former. As always, the key is to evaluate what stone you have and what its properties are before you commit to using it. Let’s delve into the details, shall we? Most likely you know by now that sandstone is a sedimentary rock. Sandstone starts out as humble beach sand. 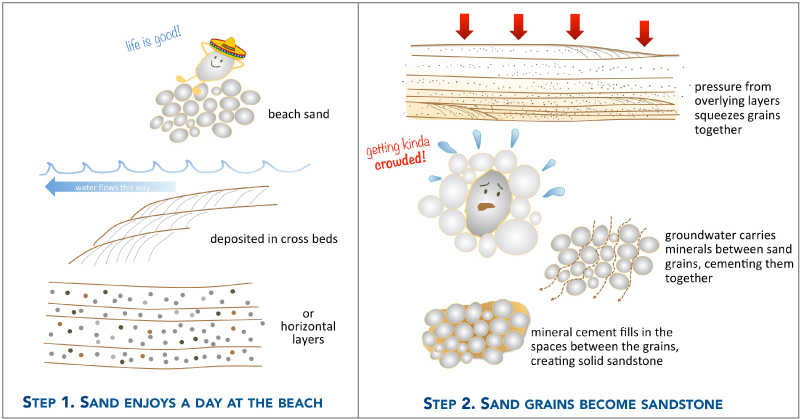 Eventually, sand gets buried and compressed by overlying layers, and minerals carried by groundwater act as glue that binds the sand grains together into solid rock. All of this and more is described in our article about sandstone. Quartzite picks up where sandstone leaves off. It’s a metamorphic rock – one that’s been baked into an extra-tough stone by the heat and pressure that only comes from deep burial way down in Earth’s crust. Such events are usually brought about by tectonic collisions, where continents grind into each other. Quartzite isn’t melted sandstone. It’s sandstone that is fused together so tightly that the sand grains lose their individual identities. The minerals crystallize together into a dense fabric of quartz crystals. The deeper and hotter the stone gets, the more tightly it’s fused. Here is the key point: The heat and pressure that turn sandstone to quartzite is not a definitive, black-and-white occurrence. It’s a gradual process, with subtle differences occurring all along the spectrum. There is no exact moment that sandstone becomes quartzite. It’s similar to the way that colors blend from one shade to the next. When does Royal Blue become Navy Blue? It’s hard to pin down, exactly. 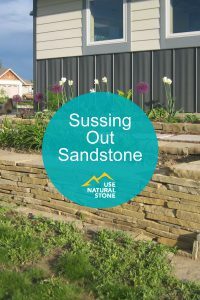 Because there is a range of quartzites and sandstones, it’s wise to assess each stone as an individual, rather than relying on broad categories or stone names as the last word on how a given stone will behave. 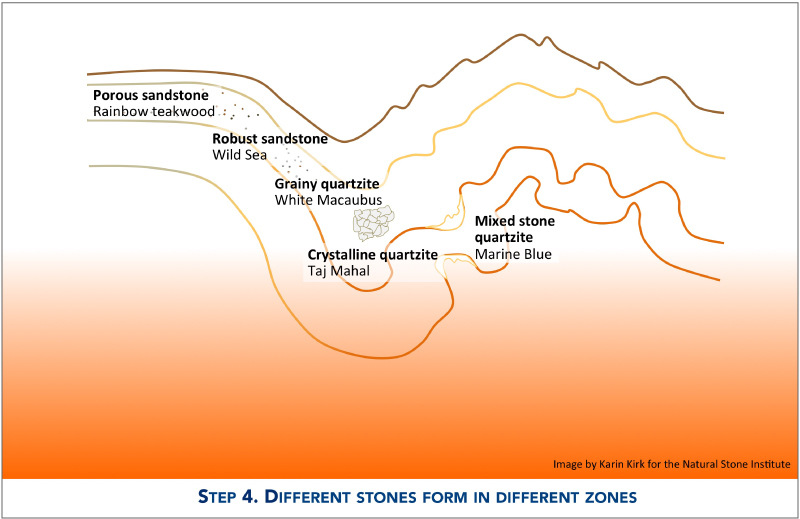 To help make these ‘shades of quartzite’ easier to understand, we can break down the sandstone-quartzite continuum into 5 categories. These range from porous sandstones, which are only loosely bound together, all the way to crystalline quartzite, which got so hot it nearly melted. Then there’s what I’ll call “mixed stone” quartzites, which are on the borderline between quartzite and other metamorphic rocks like schist and gneiss. These stones contain some quartzite, along with other minerals and rock types. In general mixed stone quartzites are darker in color than regular quartzites, and they have swirls and blobs of different rock types blended together. 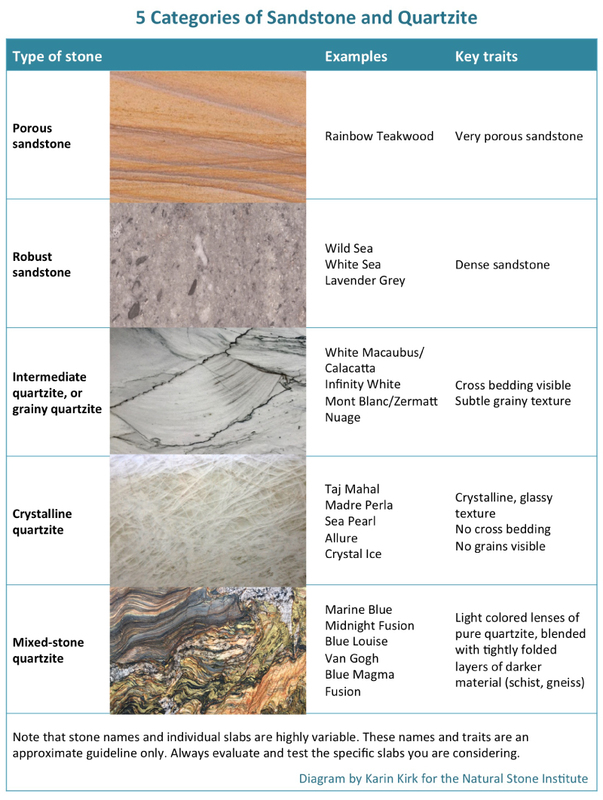 The table below outlines the 5 types of sandstone and quartzite. So, we’ve established there is a range of different stones in the sandstone/quartzite family. How do you know which is which? 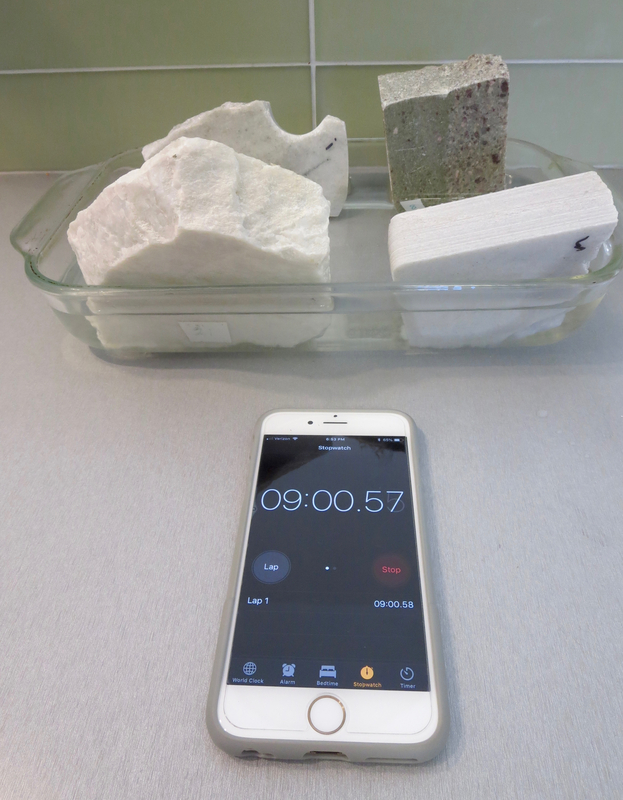 Here are three ways you can determine what type of sandstone or quartzite you’ve got. Each of these is explained in detail below. Inspect the texture – is it sandy and granular? Or crystalline and glassy? Look for signs of cross bedding, which is common in sandstone but absent in highly-metamorphosed quartzites. Test the porosity by setting the stone in water and observing if the stone soaks up water. 1. Do you see sand grains? 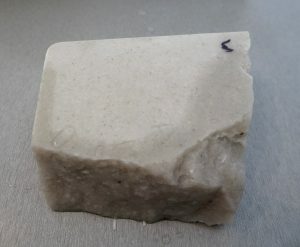 The key difference between sandstone and quartzite is whether the stone is made of individual sand grains, or has been recrystallized to the point where the grains became tightly interlocked. You can tell the difference by looking at the stone. In most cases, you need a magnifier of some sort. Bring the stone to a well-lit area. Look at the surface of a slab, not the broken edge. Look as closely as you can, and to try to see the texture and structure of the stone. Use the photos below as examples. Sandstone is made of tightly-packed grains and in some cases they are tiny grains. But you can still see individual particles. 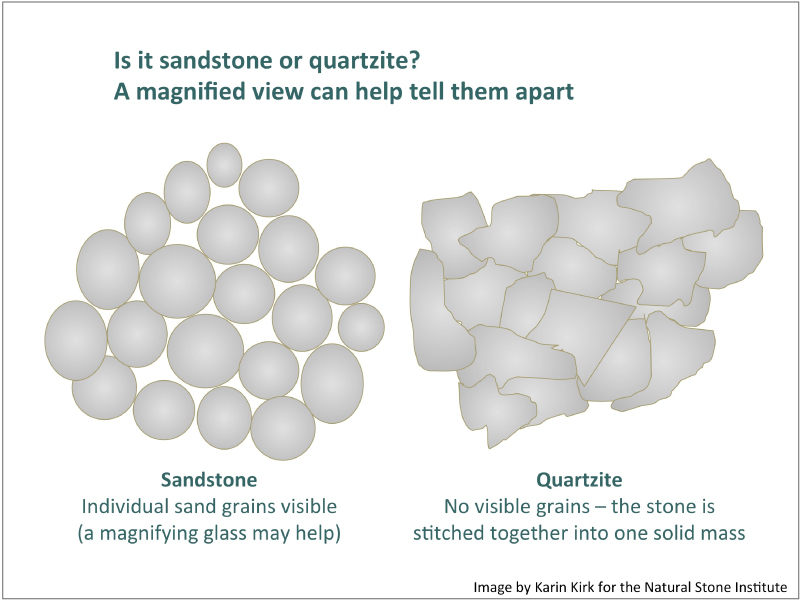 These are examples of ‘intermediate quartzites.’ The sand grains are fused together, but some grains are still visible. These stones are partway along the sandstone-to-quartzite spectrum. This is a highly-metamorphosed, crystalline quartzite. It has no visible grains at all, just a glassy, crystalline surface. 2. Do you see cross beds? 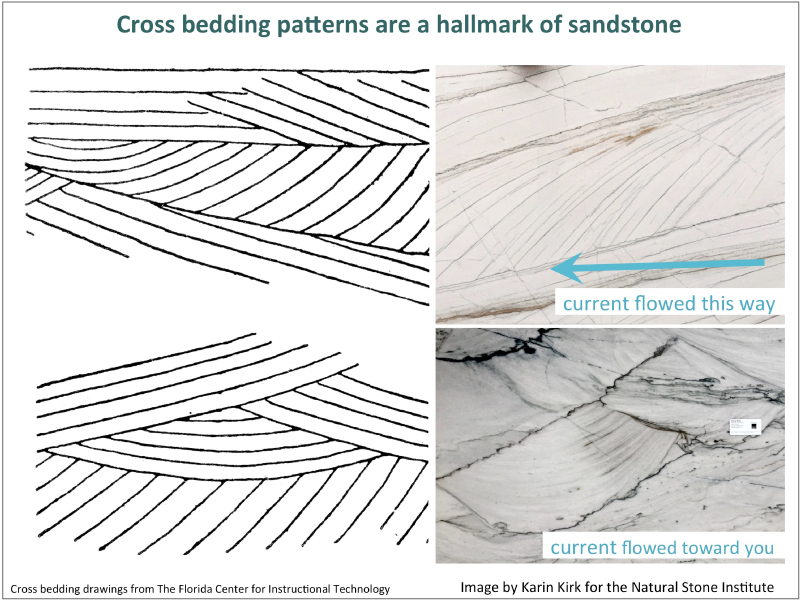 As water or wind flows across sand, it makes a distinctive pattern called cross bedding. Cross beds look like repeating, curved layers. They can be so big they take up the whole slab, or they can be just a few inches across. Sometimes the stone has cross beds everywhere, and in other cases, they occur in just a few places. 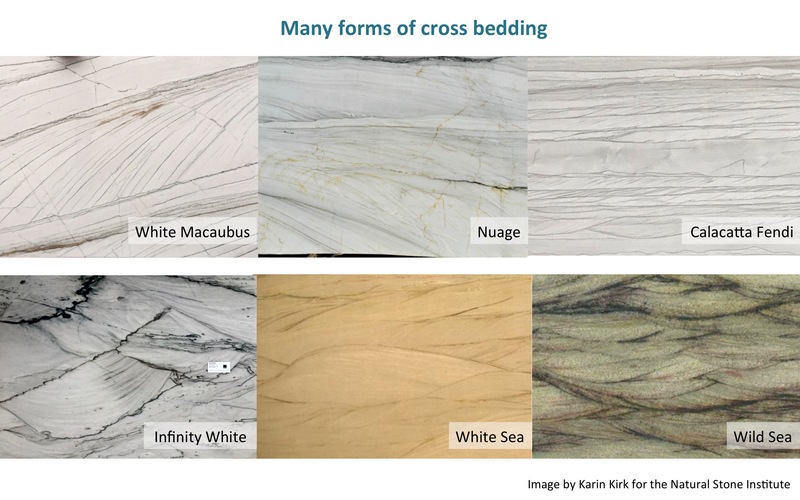 Cross beds can have several different styles, and it takes a while to tell them apart from regular layering. Cross bedding is a good news/bad news situation. The good news is that cross bedding is an easy giveaway that the stone is not marble. Yay! But that also means it’s a sandstone or a grainy quartzite and is likely to have higher porosity compared to a crystalline quartzite. When a stone undergoes a high degree of metamorphism, it fully erases cross beds. Bottom line – if the stone has cross beds, it’s important to test the porosity because the stone was not subjected to a super high degree of metamorphism. 3. Does it absorb water? The more compressed a stone got during its formation, the lower its porosity will be. An easy way to check the porosity is to take an unsealed chunk of stone and let one edge of it sit in water for about 15 minutes. Take the stones out of the water and see if you can observe water wicking up into the stone, above the level of the water that the stone had been sitting in. On the sample of White Macaubus below, you can clearly see the water has wicked up into the stone. This shows that the stone is porous. Wild Sea sandstone, surprisingly, appears to be less porous than White Macaubus quartzite. Moisture only soaked up to the water line, but no higher. This tells us that Wild Sea has particularly solid cement holding those sand grains together. On this example (Taj Mahal), the stone doesn’t even look wet. This stone has low porosity. 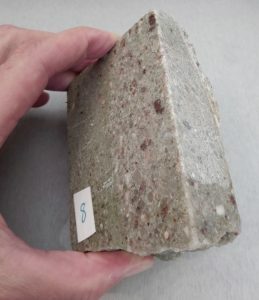 That’s what we’d expect for a crystalline quartzite, which has been subjected to intense pressures and high temperatures that welded all the mineral grains together into one solid chunk. The fact that some quartzites are porous need not be a dealbreaker. But these stones need to be sealed, which will fill in the pores on the stone’s surface. Be sure to thoroughly seal all worked edges of the stone, not just the tops, and re-seal it from time to time. Even the best sealers may require multiple applications for full effectiveness on porous stones. On the positive side, modern sealers are very resilient and should last for many years under normal use. 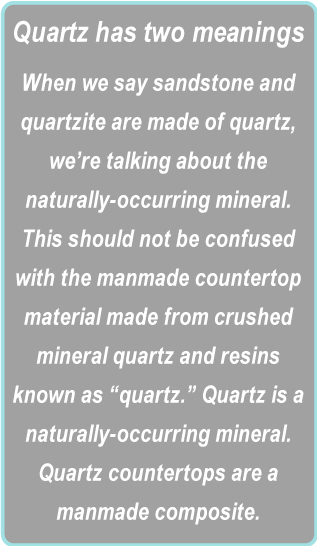 This has been a detailed look at the nitty-gritty of quartzite, so if you’ve made it this far, congratulations! Here are a few points to hammer home. Different stones form in different zones in the Earth’s crust. The depth of burial and/or the type of mineral cement determine how porous a stone is. 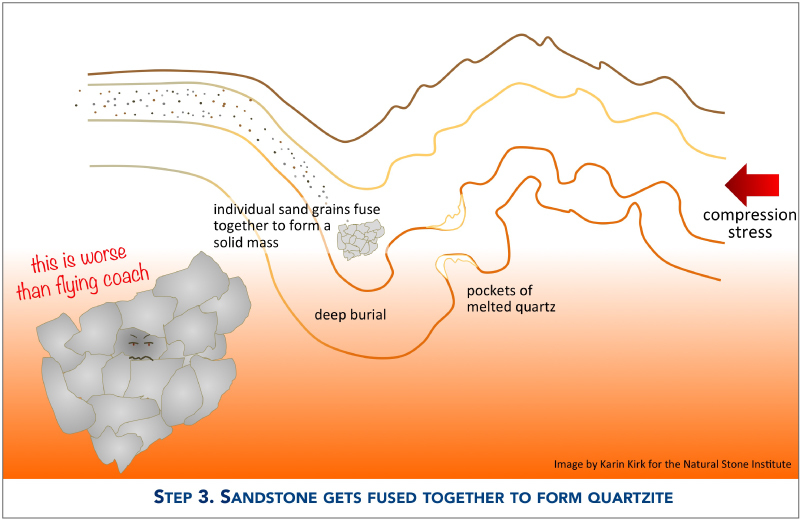 There’s a gradient of stones along a continuum from sandstone, to intermediate quartzite, to crystalline quartzite. Some stones are a mixture of quartzite and schist and/or gneiss. As always, don’t take my word for this. Stone names are variable, and stones themselves are variable. The properties will tell you so much more than the names. Always test potential stones before committing to them, because even stones in the same family can have very different physical characteristics. Learn as much as you can, and let that guide your decision about which stones to work with. 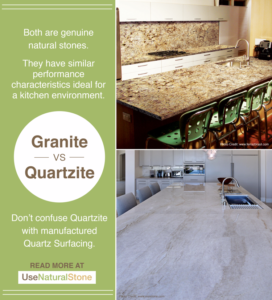 Sandstones and quartzites are fabulous, durable stones with a range of colors, patterns, and potential uses. The better we understand them, the more we can enjoy them.